Kyonan Town (鋸南町) is a port town located west side of Boso Peninsula, Chiba Pref. It has super fresh fish products from its port and great outstanding view of Tokyo Bay from Mt. Nokogiri. Mt. Nokogiri is the main feature of Kyonan Town. It is a great temple with many beautiful Buddhist statues. 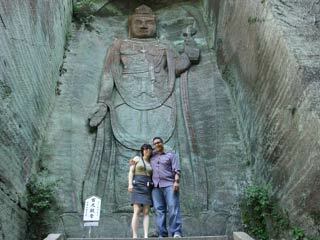 It has also great buddha, Daibutsu. There is also beach, too. Parking are available at port. 0. at Kurihama port of Yokosuka.